"I Feel Trapped by My Controlling Husband"
Shara claims that her newlywed husband, Luke, is a “mean, insecure know-it-all” who won’t let her own a cell phone, hold a job or leave the house alone — and also dictates how she should dress and wear her makeup. Luke denies all of Shara’s allegations and claims that she is “no angel” and has a vicious temper. Can this marriage be saved? 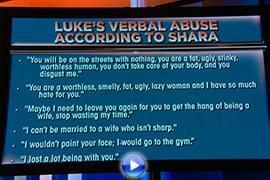 “My husband, Luke, is very controlling,” Shara says. “He manages every move I make. My marriage is definitely a prison.” Shara claims that Luke won’t let her own cell phone or leave the house alone for more than five minutes. “When I was employed, he would come with me to work every day, sit in the lobby and wait for me to get done,” she continues. “I ended up losing my job.” Shara claims Luke even tells her when she is allowed to shower. “Do you have to give her permission to shower? 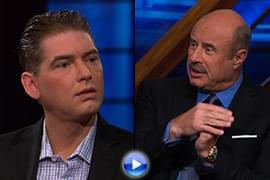 Do you tell her she can’t leave the house?” Dr. Phil asks Luke, who disputes Shara’s claims. “That was the one time,” Shara replies. “Well, I guess that’s why we’re here, because I can’t figure it out,” Luke replies. Luke also claims that Shara devised a plan to have him thrown in jail overnight on a domestic violence charge. “Immediately, when I heard a knock on the door, I knew it was the police,” Luke says. “She said I physically assaulted her, and they arrested me for domestic violence.” He adds that he was found not guilty in court. How did Shara end up behind bars after a recent argument? She insists she never touched Luke. In his own interview, Luke, too, confides that he was the victim of molestation when he was 8 or 9 years old. “For all this time, it was just this memory in my head that I never shared with anyone,” he says tearfully. Dr. Phil tells the couple that he wants to set them up with specialized counseling for survivors of molestation, as well as counseling to help them work on repairing their relationship. Luke and Shara both accept.